The Archangel is a Legendary Class unit that is suited for those players who are adept at raising defensive forces of Griffins and Undead Dragons to create the ultimate defensive strategy! How do they help you? Well they are Legendary Units people! These Units provide powerful attributes and bonuses when sent into battle with supporting Units of the same type, in this case Bestiary Units. Available now from the Black Market on browser, available soon on mobile! The Black Market sells Legendary Units – get your army to full capacity now! 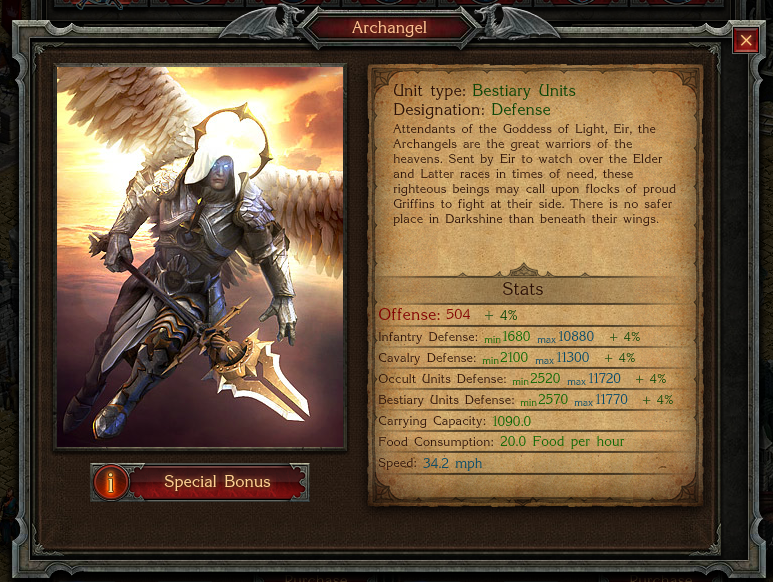 Use your Archangel for all defensive actions involving Bestiary Units. 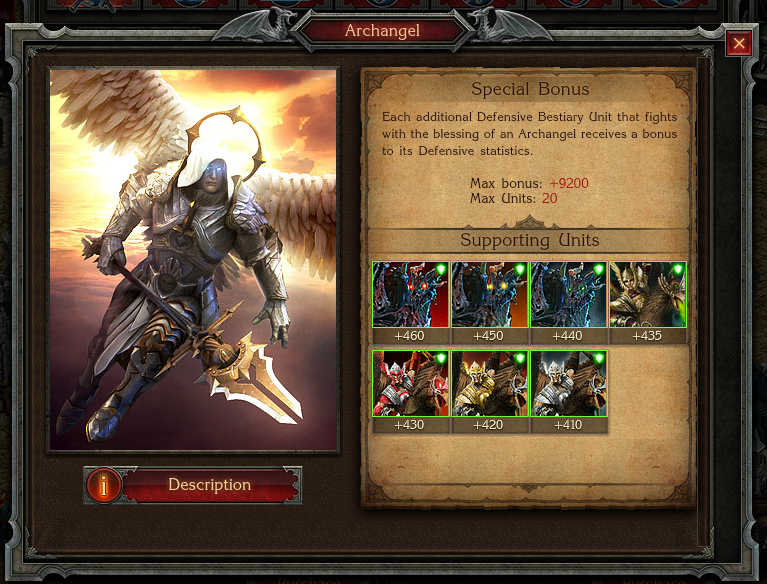 You can see below how the Archangel is empowered to a maximum of +9200 defensive points and the supporting units from the Bestiary class that are empower by its presence. Duh… it’s an Angel – scratch that – it is an Archangel … with a damn huge spear/sword thing that is going to defend your Castle; what’s not to like about that? If you don’t have Legendary Units, then you are going to find it tough in Stormfall. It takes you longer to produce low level units that have little effect, even in massive numbers. Add a Legendary Unit and then these standard Units actually start getting you somewhere in the game that enables bigger and better offensive and defensive action overall… and scares the hell out of your opponents! In the screen shot below you can see the positive effect each supporting unit receives from your Archangel as they are encircled with a green square! If, for example there were more than 220 supporting units, then the excess would not have the green square symbolizing that they have been enhanced. 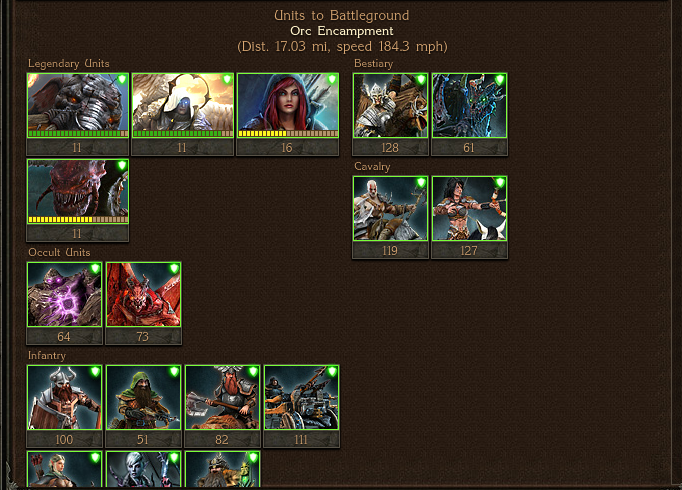 In the above image you can see how the Undead Dragons and Griffins add +2,217.5 defensive capability points. We can also see that you could add another +31 Bestiary Supporting Units for the maximum effect. The combined capability of these 189 units gives the player a defensive capability of +79,300 points! And again in the next screen shot below, you can see the comparison of how the Archangel powers up to almost maximum capability, whilst the Niathi and Hydra are not. So you need to ensure you get your supporting units numbers at the correct size here in exact numbers with the number of Legendary Units. Straight to the Black Market for this defensive champion from the heavens! You might have them awarded through doing the daily missions, but the sure fire way is to go do some micro-transactions. And these Legendary Classes of Units are worth the coin.